You know you might be slightly obsessed with ice cream when you fill your belly with blizzard before you fill your tank with gas. No worries though, I had a whopping half gallon left as I filled up (before I found myself drifting back to work). So I visited my old DQ (which is now too far from my new job). I'm pretty sure this is the first time they've tried a raspberry flavored blizzard, and if you try one and agree with my diagnosis, it could be their last. Actually, that's not totally fair. It's by no means awful, and it's different, it's just ....so so. Ok, let's try this again. 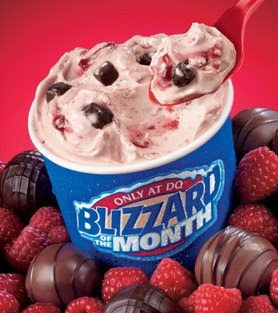 The Raspberry truffle blizzard is vanilla soft serve, raspberry topping, and "rich" truffle pieces. Mine came to me with pink and white streaks, so not quite like the picture. It was very soft so I wound up stirring it myself 'til it looked more like the picture. At first I was going to complain that the truffle pieces were non-existent, but in reality they had all just fallen to the bottom. There was a decent amount down there, and they were fairly soft ...or should I say chewy, again, it's hard to choose the right word here. The flavor was....cheapish, not real impressive. It was ok, nothing fancy, but it did remind me of something. I kept eating and it dawned on me. This tastes like a half melted, less impressive version of Turkey Hill's Raspberry Chocolate Chunk. It's kind of uncanny how similar they are, but considering the price and the flavor, I'd much rather have the Turkey Hill.